Despite its relatively small population of just over 11,000, Bordentown Township, located in Burlington County, New Jersey, sees its share of arrests for crimes like DWI, drug possession, shoplifting, as well as domestic violence offenses like simple assault and harassment. If you have been arrested and charged with a municipal offense or an indictable crime in Bordentown, it is important to hire a criminal defense lawyer who can present your best defense in court. The experienced criminal defense attorneys at our law firm have successfully negotiated with prosecutors to have the charges against our clients downgraded to a lesser charge with lower penalties, and many times, we can get the charges completely dismissed. When you choose to hire us to represent you in your case, you gain the benefit of a lawyer who will not back down to the prosecutor and will fight for you. We bring our depth of knowledge and excellent defense strategies to obtain the best result possible in your case. Do not face the charges against you alone. Contact our local law office today at 609-832-3202 for a free consultation and we will explore all potential defenses that may be available to you. With 2 miles of the New Jersey Turnpike running through Bordentown Township and traffic from U.S. Route 130 and U.S. Route 206 coming through the town, Bordentown Police make many arrests for DWI and motor vehicle offenses. Other common charges include theft from one of the many small shops and boutiques in downtown Bordentown. The police also make arrests for disorderly conduct, marijuana possession, criminal mischief, and a wide variety criminal offenses at the Bordentown train station and other local spots. If you are charged with a crime in Bordentown, your case will be heard in either municipal court or superior court, depending on the type of offense you are charged with. Disorderly persons offenses and municipal ordinance violations are heard at the Bordentown Municipal Court before a municipal court judge. If you are charged with an indictable offense (a fourth, third, second, or first degree crime), your case will be heard at Burlington County Superior Court. The lawyers at our firm have handled countless criminal cases in and around Bordentown, and are familiar with the Bordentown Municipal Court and Burlington County Superior Court. If you have been arrested in the Township of Bordentown and are facing criminal charges or a traffic summons, we can help. While undisputed traffic tickets can be paid online, violations for municipal ordinances, disorderly persons offenses, violations of Fish & Game laws and other governmental regulations, and motor vehicle and traffic law violations are heard before a municipal court judge at Bordentown Municipal Court. The sentences issued by Bordentown Municipal Court include heavy fines, jail time, community service, driver’s license suspension, probation, court fees, and additional penalties. 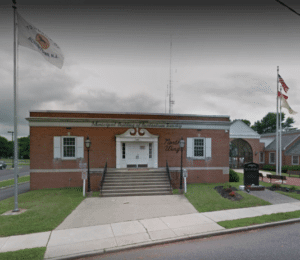 Here is some important information that you should know if you are charged with an offense and required to appear in Bordentown Municipal Court. The Bordentown Municipal Court is located at 1 Municipal Drive in Bordentown, NJ 08505. The main phone number is 609-298-2802 and the fax number is 609-291-9324. The Court Administrator, Suzanne McCanney, can be reached at (609) 298-2802, Ext. 2118. Court hours are Monday through Friday from 9 am to 3 pm, and court sessions are held every Wednesday at 9:30 am and 1:30 pm. You can get more information about the Bordentown Municipal Court on their website. Bordentown Township publishes information like events, contact information for township officials, township services, and information on public safety on the Bordentown Township Official Website. If you need to contact the Bordentown Police Department, located at 324 Farnsworth Avenue in Bordentown, NJ, you can call central dispatch at (609) 298-0101 or the station desk at (609) 298-0103. If you are facing criminal charges or a traffic offense in Bordentown Township, New Jersey, it is important to remember that you do not need to do this alone. With the risk of jail time and significant fines, it is important to protect your rights. Contact the experienced Bordentown criminal defense lawyers at our firm today at 609-832-3202 or contact us online and we will be happy to arrange a free consultation to review your case and discuss your options.